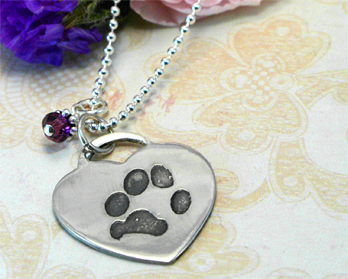 Welcome to Pet Memorial Jewelry, a place of solace for the grieving pet owner's heart. We hope that you will find comfort here, knowing that other's share your pain of losing their beloved pets. We hope to offer many pieces to help comfort you after the loss of your pet, and to help celebrate your pet's memory. Most of our pieces can be customised. We specialise in creating custom memorial jewelry for our clients, so if you do not see the perfect memorial jewelry piece for your pet on these pages, please contact our designer about creating the perfect custom jewelry piece. Oftentimes our animal companions are the only safe place we have to land, the only ones we can turn to for unconditional love and companionship. We share so many good times, and bad times, they become entertwined in our daily family. When they die we are left with such a hole in our hearts. Grief takes time...and grieving is hard work. Often people try to help us to "get over it" by trying to downplay the importance of our pet friends in our lives, in hopes that it will lessen our pain - when in fact we feel even more lonely and abandoned in our sadness. I have created my line of Pet Memorial Jewelry to help fill this need to have our grief acknowledged, to provide a way to celebrate our pet's life and memory, and to carry them with us. I have worked for years creating healing jewelry for healing from loss (miscarriage, infant loss, and loss of loved ones), and began to see the need that people have to heal from the loss of their pets. One of my favourite quotes from my grief work is " A broken heart is a broken heart." You cannot have any one upmanship in grief. Grief after the loss of a loved one, be they a tiny baby, an adult or an animal, is devastating and painful. Combining symbols with the powerful sense of a tangible item to wear and touch during the day, I believe can be a powerful tool to help us to heal; by drawing our attention back to what is happening in our body, our mind, our soul at that exact moment - and to what needs our focused energy and compassion to heal.